Ontario is found almost six hundred kilometers north of Toronto, in the northeastern part of the province of Ontario. Although the population is small at around 400 people, Gogama is known for its outstanding outdoor activities, and unrivaled fishing locations. Accessible by railway, automobile, and float plane, Gogama is considered part of the community of Sudbury. 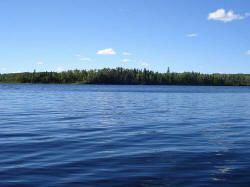 Getting its name from the Ojibway word for jumping fish, Gogama has a rich heritage of fishing, particularly on Lake Miniskawa. Twin J Hideaway is Located on Mattagami Lake in Ontario and has outstanding fishing for Walleye, Northern Pike and Smallmouth Bass. We have access to the Minisinakwa River where the Walleye and Northern Pike fishing is just great! In 1917 Arthur L’Abbe settled the area although history has shown there was a native trading post in the area as early as the early 1700s. The Canadian Northern Railway spent significant time in the area from 1911 to 1914 and discovered the amazing natural resources. When the Post Office opened in 1919 development began and forestry has been the main industry although tourism is beginning to become an important industry recently. Minisinakwa Lake Sitting along the shores of Lake Minisinakwa, Gogama offers spectacular fishing for walleye, northern pick, whitefish, bass, and perch. Locals and visitors alike fish year round and the lake is very accessible. With boats, tackle, and professional guide services available, all you have to do is get yourself to Gogama and let the fishing begin. In addition to Minisinakwa there are hundreds of small lakes in the area where fish abound. Some of the lakes are accessible while others require hiking or 4 wheeling in to enjoy the unspoiled waters. There are even some of the lakes that are only accessible by air, so a float plane journey or a “fly in” is required.If you are looking for a wilderness adventure, you have come to the right place when your destination is the Gogama area. If you prefer room service, restaurants, and guided fishing trips, you have come to the right place if you are coming to Gogama. If you desire a simplistic return to simpler times, and want to avoid urbanization, you have found your spot at Gogama. 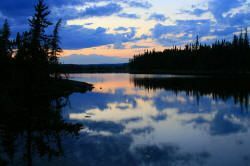 With many options for various types of wilderness vacations, Gogama offers something for just about everyone except those who need mall access 24/7. The area even has its own legendary figure. That’s right, learn all about Joseph Laflamme, wild animal charmer and larger than life character who called Gogama home. Joseph Laflamme was a colorful character to say the least. He has been referred to as a hero, a cross between Grizzly Adams and Dr Seuss. A man called Mooseman and Wolfman, who could supposedly talk to and tame animals? Fact or fiction? You can decide for yourself when you get to Gogama.